12:08: Come on then, own up… who thought South Africa were dead and buried this time yesterday? To pick a man of the day is impossible. Steyn for opening the floodgates by dismissing Warner despite his busted shoulder? Philander for leading the attack with four for 56? Maharaj for a nerveless, three-wicket spell on debut? Rabada for maturity beyond his years with the ball to keep the Aussies under wraps? Elgar for standing tall when the second innings could have fallen apart? Take your pick. They’ve been amazing and that performance today was the perfect sporting marriage of mental fortitude and technical excellence. And that’s just this blog! Thanks for your company – and have a lovely weekend. 12:01: STUMPS! That’s yer lot from Perth and what a stunning day it’s been for South Africa. Elgar and Duminy are striding off in the long shadows of a Western Australian evening with the job not done, but very well begun. The lead is a healthy 102 overnight, with eight wickets (minus Steyn) still in the shed. South Africa 104-2: Elgar 46*, Duminy 34* and 242. Australia 244. 11:54: 100 UP! The lead is also into three figures with five minutes of play remaining at the WACA. 11:44: 50 PARTNERSHIP! We’re into the last knockings of day two now, with 15 minutes or so to go. And because commentator’s curses don’t actually exist, we can safely say this: Elgar and Duminy are doing very well indeed. If they can just see off this last Aussie burst, South Africa have had a sparkling day. South Africa 96-2: Elgar 43*, Duminy 34* and 242. Australia 244. 11:26: Ooo that’s a nice, cheeky boundary for Duminy around the corner down to long leg… and he follows it up with three more through the covers off Siddle. Australia look jaded as we close out the second day, which bodes ill for them considering they’re going to be out there in the cauldron tomorrow when they mercury hits 37 degrees celsius. South Africa 88-2: Elgar 40*, Duminy 29* and 242. Australia 244. 11:14: Elgar has worn one on the forearm, so they’ve taken a drinks break while he has the magic sponge applied. Starc and Hazlewood are back in tandem, with the former looking distinctly unhappy at having to haul his carcass in at the end of a long, annoying day. South Africa 77-2: Elgar 38*, Duminy 20* and 242. Australia 244. 11:00: Breaking news: The Australians are revolting! 10:55: Don’t underestimate how hard Elgar is working here. He’s been almost Misbah-ul-Haq-like with his dogged patience punctuated by outbursts of imposing ball-striking. He lofts Lyon over his bald bonce for six this time. Starc is returning and the lead is 63. Big passage of play coming up before the close. South Africa 65-2: Elgar 35*, Duminy 12* and 242. Australia 244. 10:44: 50 UP! Duminy unfurls a corking cover drive to move off the mark, before taking another three from a similar stroke off Lyon in the next over. Getting on that front foot feels important right now. Just keep nudging that score upwards, chaps. South Africa 53-2: Elgar 28*, Duminy 7* and 242. Australia 244. 10:34: WICKET! Hazlewood does for Amla for the second time in the match. Bowled off an inside edge after failing to move his feet, South Africa’s rock has managed just a single in the entire Test. No sign of Du Plessis at four again – it’s Duminy making his way out to the middle. That means another left-hander for Lyon to play with, which might not be the greatest idea. Faf? Faf?! South Africa 45-2: Elgar 27*, Duminy 0* and 242. Australia 244. 10:21: WICKET! The crab ventures out of his shell for the first time and is turned instantly into paste. Cook mis-timed his pull shot badly off the bowling of Siddle, with Shaun Marsh clinging on at mid-wicket. He made a fairly painful 12. Here comes the mighty # with the lead standing at 33. South Africa 35-1: Elgar 18*, Amla 0* and 242. Australia 244. 10:18: In the first real sign of aggressive intent, Elgar plants Lyon back over his head for four. South Africa are doing just nicely here. With over three days left in the match, they can do as they damn well please. 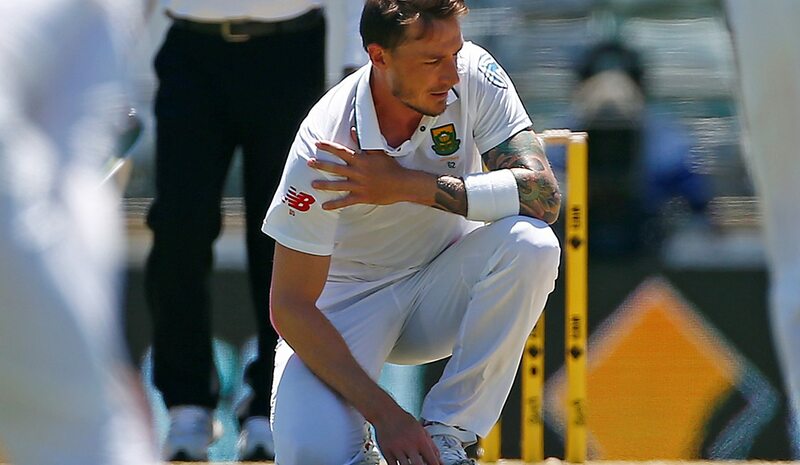 On the injured Steyn, by the way, rumours of a stress fracture in the shoulder are surfacing. The suspected cause: carrying a nation’s hopes for a decade. 10:07: 13 overs in and it’s our first second innings sighting of a Lyon. The spinner produces five good deliveries and one absolute shocker, that Elgar flaps straight to point. End result: a maiden. South Africa 29-0: Elgar 13*, Cook 11* and 242. Australia 244. 09:56: Not remotely live, but we like it very much anyway. 09:48: First objective achieved. The openers have seen off Starc and Hazlewood and are showing signs of easing into the task as Siddle and Mitch Marsh muscle in for spells of their own. Every run is now one the Aussies have to get (stating the obvious klaxon!) but the fact it will set them up with a target, as the weather hots up tomorrow and the cracks widen in the pitch, makes a steady start all the more precious. South Africa 25-0: Cook 11*, Elgar 9* and 242. Australia 244. 09:34: Kepler Wessels, meanwhile, is using his stint on commentary to discuss a time “when men were men.” We are unable to confirm what he thinks women were, but you’re welcome to play along and take a guess. Just for fun. 09:30: The Crab sticks despite a huge yell for a catch behind. He’s done nothing but claw the ground with his bat, though. At least no one shelled it. South Africa 12-0: Cook 4*, Elgar 7* and 242. Australia 244. 09:20: SOUTH AFRICA ARE AHEAD! Ring the bells and rejoice! Cook is batting like an anti-social crab taking refuge under a storm-battered umbrella. But no matter as he finally lays a proper bat on his 12th ball, guiding the wayward Starc down to third man for four. South Africa 6-0: Cook 4*, Elgar 2* and 242. Australia 244. 09:16: In the words of Randy Newman: “Short people got no reason to live.” Shame, Temba. 09:10: Right then, strap yourselves in for the final session. If it’s anything like the last three hours of play, it’ll be a humdinger and a half. Cook – on a pair – faces up to Starc, who sends down a load of leg side dross before finding his radar, only for Cook to edge just shy of second slip. It’s relentless, this. South Africa 0-0 and 242. Australia 244. 08:50: WICKET! AUSTRALIA ARE ALL OUT! Lob in any superlatives you fancy for that – South Africa have been absolutely magnificent with the ball today. Lyon is the last man to fall, edging Philander through to Dean Elgar at slip. The Aussies have lost all ten wickets for 86 runs today, having been 158-0 with Warner poised to unleash mayhem not so long ago. Elgar and Stephen Cook will look to atone for the first innings sins after Tea. Australia lead by just two runs on first innings, which was absolutely unthinkable earlier on. Australia 244 all out. South Africa 242. 08:48: WICKET! This one will not be heading into the Big Book Of The Best Wickets Ever. Do we care? Not a jot. It’s a fairly filthy loosener from Philander that Hazlewood somehow guides straight to JP Duminy at gully. Oops. Australia 244-9: Siddle 18*, Lyon 0*. South Africa 242. 08:45: AUSTRALIA TAKE THE LEAD! With an ugly heave down the ground from Hazlewood that narrowly evades mid on. Phildander, despite half-crocking himself fielding on the boundary a minute ago, replaces Rabada, who has played a fine hand. Australia 243-8: Siddle 18*, Hazlewood 4*. South Africa 242. 08:35: WICKET! It’s a third for Maharaj! Nevill lopes on to the front foot, edges (possibly) and Hashim Amla defies his rigid frame to take a wicked diving catch an inch above the turf. The batsman didn’t fancy umpire Dar’s decision much – and it did look distinctly paddy – but then the silly sods shouldn’t have wasted their reviews. Australia 232-8: Siddle 11*, Hazlewood 0*. South Africa 242. 08:30: DRS ALERT AND… NOT OUT! Siddle shapes to duck a ball from Rabada that clatters into his back elbow. Ball tracking shows it is sneaking over the top but Siddle was in a right old tangle there. Australia 226-7: Nevill 17*, Siddle 11*. South Africa 242. 08:26: Dangerous creatures, Aussies on ropes… Siddle clonks one to the long on boundary from Maharaj, who has now churned through 14 overs on the bounce. Nevill joins in at the other end, throwing the bat at a wide one from Rabada, who could be forgiven for tiring a bit by this stage. Has Philander got another burst in him right now? 08:18: Australia are on the ropes here. Maharaj continues to bowl with impressive control and they just need to sneak the last three out before putting memories of their own ropey first innings to bed. New man Siddle is facing up to Rabada, who keeps the pressure on with an arrowing yorker. Australia 209-7. Nevill 12*, Siddle 0*. South Africa 242. 08:09: WICKET! With all the reliability of Metrorail, Starc scrats about for four deliveries before clipping Maharaj straight to midwicket where the catch is safely pouched by captain Faf. Maharaj has bowled really well, by the way. Taking on the extra responsibility in the absense of Steyn, keeping a full length and just turning the odd one. Really solid stuff. Whisper it gently, but we could even be talking about a first innings lead here. Australia have lost seven for 45. Who would have thought, eh? Australia 203-7: Nevill 5*, Siddle 0*. South Africa 242. 08:04: WICKET! Much of the Aussies’ recent discomfort has been caused by Rabada, returning in place of Philander. He probes away, full and straight and holds on to a leading edge from Voges that came straight back to him. We’re into the bowlers! Australia 203-6: Nevill 5*, Starc 0*. South Africa 242. 08:00: 200 UP! They don’t look remotely comfortable out there, but Voges and Nevill are fighting hard to see Australia through this rough patch. Nevill has four from 33 balls, so plenty rests of the shoulders of his senior partner. Australia: 202-5: Voges 27*, Nevill 4*. South Africa 242. 07:43: Here’s how close Philander was to a third wicket. Australia 188-5: Voges 15*, Nevill 2*. South Africa 242. 07:35: Go on, review that. 07:27: WICKET! The Aussies have lost five for 23 as Philander pins Marsh on the back leg. That’s just the ticket for the Ravensmead Wrecker, who picks up his second. With the dubious Peter Nevill coming out to the crease, the Proteas are right back in this. Australia 181-5: Voges 10*, Nevill 0*. South Africa 242. 07:19: After an annoying delay to fix the sightscreen – which is the single biggest threat facing cricket today – we’re off and running as Philander completes his over. Maharaj continues from the other end and has Voges in trouble as the ball looks to have popped up into no man’s land off bat and boot. No runs yet since the interval, the Aussies trail by 61. Australia 181-4: Voges 10*, Mitchell Marsh 0*. South Africa 242. 07:09: Welcome back, folks. Ready to take the plunge into the second session? We certainly are. An update on the crocked Steyn: he’s gone to hospital for a scan on his bothersome right shoulder, so no more of him for the foreseeable. All the more incentive to collect the last six Australian wickets quickly, then. 06:35: A placid first hour gave way to all sorts of fun and games in the second. Four wickets, milestones reached, milestones missed, injury drama and a healthy dose of controversy and Aussie whining. Steyn burst things open – in the match and in his shoulder – by finding Warner’s outside edge, before Rabada, Maharaj and Philander all took responsibility with a wicket apiece. Be in no doubt, South Africa have a hell of a lot of work still to do, particularly with Steyn back in the dressing room with a strapped up shoulder. But if they can just sneak into a long-ish Australian tail after the break and keep the lead anything under 100, they’ll consider themselves in with a sniff. The Aussies were 158-0 a blink of an eye ago. We’ll leave you with that happy thought and be right back with the second session in half an hour or so. Australia 181-4: Voges 10*. South Africa 242. 06:27: DRS ALERT… WICKET AND LUNCH! Philander’s in on it too! Persisting with the angle around the wicket, reliable old Vernon has done for the thoroughly irritating Shaun Marsh LBW. While Smith’s review a little earlier was incredulous, this one was hopeful at best as the ball is shown to be clattering into leg stump. They head off for a sandwich with South Africa feeling pretty fine after that morning’s work. 06:12: If you’re joining us from First Thing, by the way, hello there! It’s all go in Perth, you know. The door we told you had slammed shut must be a revolving one as Rabada and Maharaj have given South Africa a serious lift with the wickets of Khawaja and Smith in quick succession. Stay tuned here for all you need to know from a suddenly enthralling game and drop us a line, if you’re so inclined, at: [email protected]. 06:06: DRS ALERT AND… WICKET! Good grief Maharaj has only gone and dismissed Smith for a duck. The Aussie captain skipped down the track to a ball that skidded on a touch. Frankly, he got himself into a right mess and the fact that only a fraction of the ball was shown to be clipping the top of leg stump on review is none of his business. People of South Africa: Aleem Dar is ON our Christmas list. Australia 168-3: S Marsh 61*, Voges 0*. South Africa 242. 06:00: WICKET! What do you need when the old war horse has gone off crocked? The young buck to step up. Rabada has done that with a ball from the gods. From around the wicket he’s ripped Khawaja’s off stump out of the ground with a shade of late swing and gorgeous seam position. A seriously impressive reaction from the youngster. We see the future. And it looks like Rabada. H must just make sure that arm-pumping celebration doesn’t become the second knackered shoulder of the morning. Australia 167-2: S Marsh 60*, Smith 0*. South Africa 242. Maharaj is thrust into the fray to replace him but that leaves a massive hole in the South Africans’ bowling armoury. Australia 166-1: S Marsh 59*, Khawaja 4*. South Africa 242. 05:37: WICKET! Oh you beauty! Steyn switching ends has paid off as Warner nicks behind to Hashim Amla at first slip for 97. It’s taken nearly 36 overs of sweat and toil and they can perhaps thank that drinks break for disrupting the flow of the Aussie opener. So that Philander no ball yesterday has just cost the 80 runs. Out comes Usman Khawaja. Australia 158-1: S Marsh 55*, Khawaja 0*. South Africa 242. 05:31: That’s the first hour done and dusted as the players take a drink – and it’s been a frustrating one for the tourists. Steyn, Philander and Kagiso Rabada have all had a decent go, to no wicket-taking avail. Truth be told, it looks as good as it gets for batting out there and South Africa have yesterday’s lacklustre batting and ill-disciplined bowling to blame for their current predicament. Captain Faf du Plessis isn’t far away from having to make a call on when he’s brave enough to risk Keshav Maharaj against Warner. He’s been positively quiet so far. Gulp. The debutant’s contribution so far this morning has been two misfields. 05:25: 150 UP FOR AUSTRALIA AND 50 UP FOR SHAUN MARSH! He’s played the perfect hand for his country so far in the shadow of his whirlwind partner. Only a third of the runs, but half of the responsibility. He drives Steyn – who has changed ends – through the covers to reach his ninth Test match 50. It’s also his first on home turf. Australia 153-0: Warner 95*, S Marsh 53*. South Africa 242. 05:10: APPEAL FOR CAUGHT BEHIND! But only from Kevin Pietersen in the commentary box. Marsh was no where near it as his bat hit the ground, which didn’t stop the newly repatriated Pietersen yelping like an over-excited school boy. Thankfully Mr Sensible Shaun Pollock was on hand to calm him down. And Kev said commentary was “the easiest job in the world,” yesterday. Heh. Here’s the evidence. Nothing for SMarsh to worry about. 05:02: The senior bowlers have started very deliberately at the WACA. Not that it has stopped Warner caning one through the covers for four off Philander. A half-hearted LBW shout follows and there’s a damn sight more control than yesterday’s final session. Australia 124-0: Warner 81*, S Marsh 41*. South Africa 242. 04:50: If you’re casting your mind at this early stage to weather or bad light coming to South Africa’s rescue down the line… you may want to put that to one side. Unless Donald Trump gets his little hands on the big red button ahead of schedule, there will be no disruptions whatsoever in Perth. Sunny and warm all the way. The Aussies trail by 125 as both sides make a steady, unobtrusive start. Australia 117-0: Warner 76*, S Marsh 38*. South Africa 242. 04:39: Hmm. ten runs from the first three overs – bowled by old stagers Vernon Philander and Dale Steyn. The Proteas face a tricky task in being aggressive and proactive, without ‘trying to hard’ in searching for that crucial first wicket. Does that make sense? At this hour, who knows, but let’s go with it! Australia 115-0: Warner 74*, S Marsh 38*. South Africa 242. 04:25: A very good, very early morning, brave lamplighters. A warm welcome to our live coverage of the second day of the first Test at the WACA. As for yesterday? Eish. It was a tough one for Faf du Plessis’ men. You can read Antoinette Muller’s sleep-deprived view on proceedings here and check out the day as it happened if you need reminding or simply fancy a wander down memory lane. David Warner (73) and Shaun Marsh (29) start play with a superb platform after putting on an unbroken 105 for the first wicket at a fair old lick, once South Africa had subsided to an underwhelming 242 all out.